"Crow-boy will never be able to out-wit my criminal mastermind!" The above info came from Kefka, and was edited by yours truly (contact me). The image came from DVDanime.net. 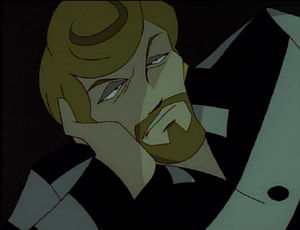 Jason Beck is a reoccurring villain in the Big-O series. He is a kind of arch-nemeses of sorts to Roger Smith, though Roger never considers him to be a major threat, always referring to him as a 'small time crook'. Beck always dresses in gold, enjoys combing his gold-blonde hair, and loves personalizing everything he owns. He first arrives on the scene in a negotiation with Roger Smith, agreeing to surrender Dorothy for a large amount of cash, but the deal falls though rather messily. Next he uses a Megadeus he stole from Dr. Timothy Wayneright, Dorothy 1, to attempt to steal money printing presses, but the robot is destroyed by Big-O. Beck ends up landed in prison because of this, but he manages to break out several times, each time running into Roger who uses Big-O to get him back in again. He is a very persistent man, but he does not learn well from his mistakes, using the same traps, plans, and ideas that he uses before, and always with the same result. He is also very vain, always combing his hear and complimenting himself on his own attire or achievements. He utterly detests Roger, seeing him as the reason his great plans never work. Side notes: Beck usually refers to Roger as 'Crow-boy', probably due to the fact that Roger always wears black. He usually keeps his hair in a nice cowlick, but on one occasion when he was shocked by lightning, he developed a very large afro, at one point earning the name 'Curly haired buffoon' by Dorothy. Beck has a bad habit of labeling all of his things either with Gold or a large golden 'B', also naming all of his Megadeus's after himself.